Spring is the season for academic conferences. As such, I am brainstorming ways we can improve the experience at public administration conferences. Now, I am not saying there is something seriously wrong with our conferences. The regional and national public administration conferences provide intellectually stimulating experiences, plenty of opportunities to network with colleagues and practitioners and a chance to receive practical feedback on work in progress. Nonetheless, there is room for improvement. But first, what are people hoping to get out of academic conferences? After speaking with a few colleagues (both academic and practitioners), I am convinced there is no universal opinion of what folks want to get out of a conference. Some see conferences as CV building, some as a chance to engage with new ideas, some as a place to test out new work and some as a time to socialize and network. 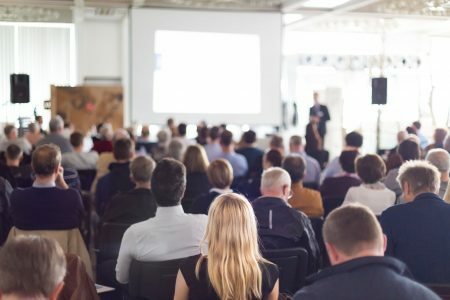 It follows that no conference can be everything to everyone, but there are some logical changes that would make a more inclusive and educational experience. Recommendation 1: Childcare. As Ph.D student Hannah Lebovitz’ academic parenting blog series details, parents of young children often face unique challenges when engaging with the broader academic community. Offering drop-in childcare alleviates one of these barriers. Several conferences have begun doing this and it makes sense for more to follow suit. Recommendation 2: Trading swag for scholarships. Conferences are expensive. ASPA’s Annual Conference fee, for example, is higher than the amount of travel money I am allotted at my institution. It is problematic that many academics must either pay their own way or forego the conferences essential to their career development. The situation for graduate students is worse. Though I enjoy a nice bag, mugs, and perusing heavy printed programs, I wonder if some of the swag money could be redirected toward scholarships for attendees, so as to make our conferences more accessible for more people. Recommendation 3: Junior scholar keynotes. In my experience conference keynotes are of uneven quality. This perception is probably unavoidable; I am sure many enjoyed speakers I did not, and vice-versa. But having only “big name” speakers tends to make things predictable, and serves to reinforce existing hierarchies in public administration. Of course big names are usually big names because they have made a contribution and have something important to say. But the ideas that can challenge our field may come from voices who are not yet big names. Giving junior scholars a platform could mix things up by spurring debate and new thinking. At the very least it would not be boring. Recommendation 4: Cool it with the awards. Everyone loves trophy. Awards are important for recognizing quality work and are tangible enough to aid scholars during the tenure and promotion process. They are also personally meaningful; nomination alone can be a way to show your respect for someone’s work. But the more awards we hand out, the greater the risk becomes of them losing their meaning. Now I know some awards are created because of donors. This could be another place where we use the funds for conference scholarships instead. Recommendation 5: Getting smarter about alcohol. The horror stories about harassment and abuse of position at academic conferences always seem to involve alcohol. I am not suggesting we ban alcohol from conference events, but I do think there is a need for more discussion about its proper place. Recommendation 6: Shorter panels. If something has worked fine for decades, why change it? Well, anyone who has attended a panel by themselves or presented to an empty room knows the current system does not always work fine. Some of it is timing and some if it is content. However shaving some time off of panels (either by reducing presentation times or reducing the number of presenters) would give audience members a greater ability to pick and choose presentations they want to attend without committing such a large chunk of time. Recommendation 7: Mixing up panels. So often it seems panels are configured by academic class, i.e. a panel of senior scholars, one with grad students, one with scholars from R1 universities, etc. Though some of this is coincidence and/or a function of what people happen to be studying, a proactive effort to break down some these academic class walls could expose more good work to more people. Some of these recommendations are more realistic than others, and no doubt there are many other ideas missing from this list. But as I attend ASPA’s Annual Conference in March, and prepare for the Midwestern Public Affairs Conference in September, I will be looking for new ways to make the most of our public administration conferences. Author:Michael R. Ford is an assistant professor of public administration at the University of Wisconsin – Oshkosh, where he teaches graduate courses in budgeting and research methods. He frequently publishes on the topics of public and nonprofit board governance, accountability and school choice. He currently serves as the president of the Midwest Public Affairs Conference.